Sports Shooter Workshops: What and Why? The Sports Shooter Academy is a hands-on workshop that gives participants the opportunity to cover NCAA Division I sports under the guidance of a faculty of award-winning photographers in Southern California. The workshop is open to college students and working professional photographers who want to expand their experiences, add to their portfolios and learn from some of the top photographers working today. On each of the three shooting days, participants have a wide variety of sports events to put on their individual schedules. Depending on the season, the Sports Shooter Academy has on its list of events: college basketball, volleyball, soccer, swimming and diving, water polo, track & field, softball and tennis. Additionally the workshop has included other sports such as pro beach volleyball, horse racing, rugby, junior college football, crew and boxing. Academy instructors are at each of the events on the schedule and offer an overview of the sport, along with tips and suggestions for shooting positions. Editing and critique sessions each night give participants a deadline to file their best work of the day. "It's real world experience here folks, " says Academy instructor Matt Brown, a Southern California freelance photographer. The Sports Shooter Academy also includes several classroom sessions, with past workshops covering topics such as digital workflow, arena lighting, portraits, using remotely triggered cameras, business practices and underwater photography. Sports Shooter Academy III participant and Palm Springs Desert Sun staffer Marilyn Chung readies her net remote camera she would use while covering the Big West Conference Women's Soccer Tournament at Long Beach State. "What we try to do with this workshop," says Sports Shooter founder Robert Hanashiro, "Is give students and working pros a chance to shoot real sports events where they can experiment, try new techniques, learn about remotes, location portrait lighting, expand their vision and then get immediate feedback from the faculty at the events and during the nightly editing sessions." Faculty members at past Sports Shooter Academy workshops have included: Wally Skalij of the Los Angeles Times, Michael Goulding from the Orange County Register, Myung J. Chun of the Los Angeles Times, adventure and outdoor photographer Lucas Gilman, Donald Miralle of Getty Images and NBA Senior Photographer Andrew Bernstein. 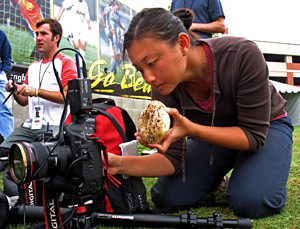 The Sports Shooter Academy was developed by Hanashiro, a USA TODAY staff photographer and Brown, who is the official photographer for several Big West Conference schools. "I have always wanted to put on a hands on photography workshop where the students can shoot real sports events rather than practices or something staged," said Hanashiro. "One Sunday afternoon a couple of years ago I was talking to Matt in the first base photo box at Dodger Stadium about my idea and a huge light bulb seemed to just click on over both of our heads." "Matt's great relationship with Cal State Fullerton, U.C. Irvine, Cal State Long Beach and the Big West Conference has given this workshop access to events that no other educational program has. The quality of the sports and the venues is top notch." Sports Shooter Academy V was held in March of 2008 with over 50 participants. A smaller two-day workshop, the Sports Shooter Academy Boot Camp was spun off last year with that program concentrating on specific aspects of photography. Past Boot Camps have emphasized portrait lighting and another multimedia production. "Sports Shooter Academy is more about seeing the picture as much as it is about shooting it, " said Goulding. "The process you go through as a participant in The Academy is great. You're on site with good photographers ... and you talk about the picture you want to shoot there and how to see them. Then you go into the editing room and then into the critiques with them and follow that evolution all the way through. "I think it really grounds you in the idea you have to see the picture before you really make the picture. When you see better, you shoot better." "I really had an amazing time at the workshop. I was blown away by the time and hands-on instruction each of the instructors gave. This is a must do workshop, even for those that aren't interested in becoming sports photographers (like me). It was such a great learning process on so many different levels. I feel my shooting improved by leaps and bounds." "The faculty was so amazing, but also down to earth and approachable during the entire workshop. They really helped to open my eyes in the way I look at sports. Also it was great meeting the fellow photographers attending the workshop. 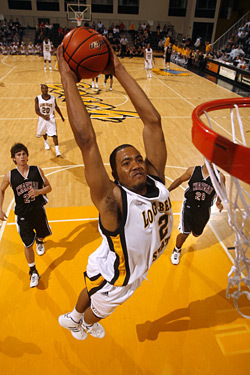 It was interesting to see how everyone approached the same sports but in different ways." "This is an experience that you cannot pass up. Nightly critiques are especially important because the experienced faculty provide essential feedback and advice that you cannot get anywhere else. Shooting events alongside professionals who are willing to answer any question you can think of, as well as one-on-one critiques, let me walk away with tons of valuable information and experiences. Great for students who want to build up an awesome sports portfolio... in four days, I got more than a semester's worth of great photos! SSAII was a great experience and an important stepping-stone to my photo career." "This workshop definitely lived up to its billing as the coolest sports photography event of the year. The opening speaker was inspiring, the classes were informative and the events were a blast. The nightly critique sessions were invaluable. The all-star faculty couldn't have been more giving of their time and knowledge - before the events, on location and during the reviews. The small number of participants allowed for plenty of one-on-one instruction. The jam-packed schedule coupled with the interactive nature of the workshop means you are literally becoming a better photographer every waking minute. A must-attend for the workshop hunter, the Sports Shooter Academy is a real gem." Yes, more workshops are being planned, and this is where you'll find the information about them. Keep up with the latest news and information about the next Sports Shooter Academy. - All the details! ::.. The Sports Shooter Academy experience is a special one. But, don't just take our word for it. If you're interested in re-living the fun times of the past, or if you just want to experience a little time-travel without a flux capacitor stainless steel car, well, here's your chance. Held September 5 & 6, 2008 in Southern California. Held April 2007, sponsored by Canon USA, Think Tank Photo, Apple Computer and Samy's Camera. - SS Academy IV video recap ::..
Held Nov. 2006, sponsored by Canon USA, ThinkTank Photo, and Samy's Camera. - Story from Day 1 ::..
- Story from Day 2 ::..
- Story from Day 3 ::..
- Video from SSAIII ::..
Held Apr 2006, sponsored by Nikon and Samy's Camera. - Story from Crystal Chatham ::..
- Story from Zach Honig ::..
- Story from Jesse Bowman ::..
- Lighting Video from SSAII ::..
- Horse racing video from SSAII ::..
- Track & Field video from SSAII ::..
Held Feb 2005, sponsored by Nikon and Samy's Camera. - Story from Day 1 by Max Morse ::..
- Lessons Learned by Chris Detrick ::..
- Story from James Rulison ::..
- Story from Andrew Malana ::..
Held Nov 2005, hosted at Brooks Institute of Photography, and sponsored by Nikon and Canon USA. Held Nov. 5 and 6, 2004, and hosted by Nikon in Redondo Beach, California. - See pictures from this workshop ::..
- See the promo video ::..
Held Nov. 7 and 8, 2003. Hosted by Nikon in Manhattan Beach, California. Held Nov. 1 and 2, 2002 and hosted by Nikon in Manhattan Beach, California. - 2003 Workshop - Highlights ::..
- See pictures of this workshop ::.. Hosted by Nikon on Nov. 10, 2001 in their Torrance, California offices. Want to see what other kinds of photojournalism and photography workshops are available? Check our 'Educational Programs' listings.